Salesforce Rival SAP has announced a $6.3 billion buyout of Business Objects. It will be interesting to see how this will impact the products they have integrated into the Salesforce appexchange, namely crystal reports. One has to think they will cut off ties with Salesforce and incorporate the Business Objects products into their recently announced on demand CRM product. I’ve been using the Salesforce Firefox Plugin for more than a year now and its been absolutely fantastic. I was just browsing some applications on the exchange and noticed a listing for The AppBar, which is a browser toolbar specifically for Salesforce.com. 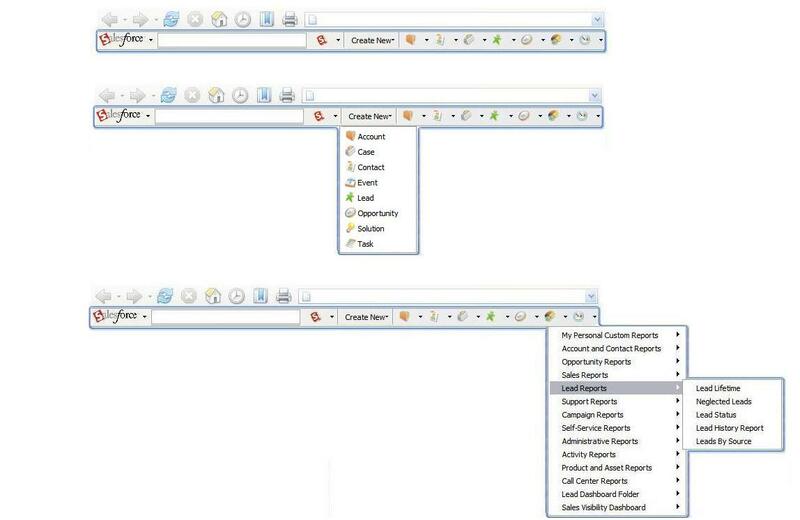 I’m not normally a fan of browser toolbars simply because of the amount of space they take up, but I think this one might really be a winner for Salesforce users. 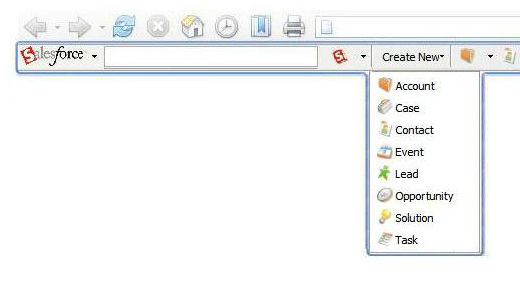 The Firefox Plugin is really simple – once installed it adds a searchbox inside your browser and lets you perform an advanced search across any object in your organization. It actually works better than the default search on the homepage since it uses the “advanced” search, not a standard search. The new Appbar developed by 3 Salesforce employees (although it doesn’t see to be an official Salesfoce app) goes way beyond the simple search functionality and creates a bunch of shortcuts into your application. When you complete a search you can choose from several options, even searching the appexchange. One of the big time savers should be the ability to directly link to add accounts, contacts, tasks, etc. The next big time saver are the views buttons. Each of these buttons lets you instantly link to any of your pre-formatted views, saving at least a few clicks each time. I’m definitely going to try this out a bit longer to see if I hit any snags, but so far the only drawback seems to be the real estate I lose at the top of my browser. I highly recommend trying out both of these if you haven’t already. If you’re stuck using IE as your only choice of browser, well then I really feel sorry for you…. Timeline S-Control Is Very Cool – Too Bad I Can’t Use It. When I first saw Arrowpointe’s Google Maps Mashup for Salesforce.com, I was drooling over the functionality but I lack the technical skills to pull this kind of implementation off. 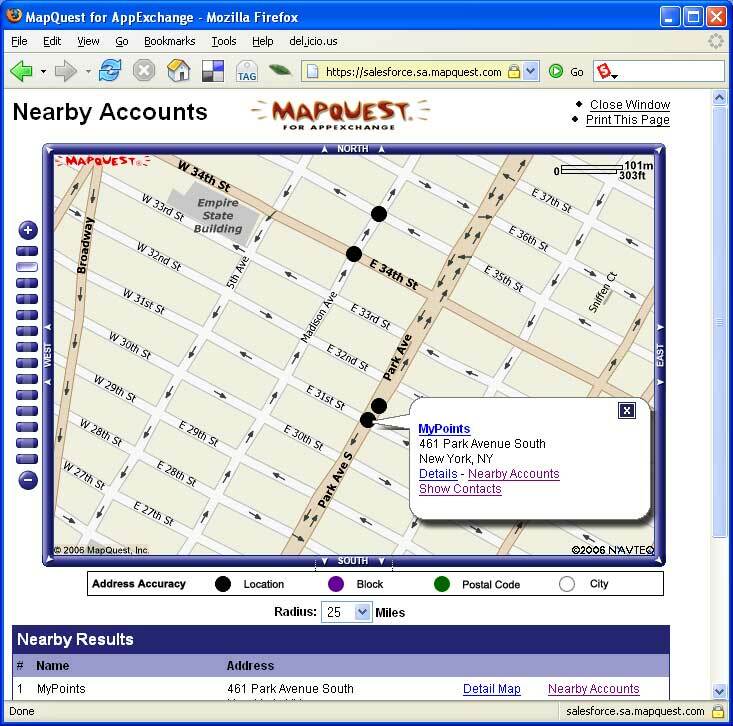 When I met the folks from Mapquest at Dreamforce 2006, they promised a free and easy to install application that would give me the ability to map a contact or account and see others that are nearby. While I don’t really “need” this functionality it sounded cool and I knew I wanted to give it a try. The application launched a couple of days ago so I sat down today to install it and see what it had to offer. After downloading the app from the exchange I didn’t see any of the buttons or functionality – what I didn’t realize is that there is a customization document with some instructions that you need to follow before this will work. At first the 37 page PDF was a little intimidating, but its filled with tons of easy to follow screen-shots (trust me – if I can do it anyone can). The only hiccup I had was when the instructions stated to copy and paste the code for the custom formula but the formula had some extra spaces in it that need to be removed first. When it wasn’t working for me I emailed their support and got an immediate response with how to correct it. Once you’ve created your custom formulas you’re pretty much ready to go. I think this would take most folks less than 15 minutes to get up and running. Once you install the functionality you can let the fun begin. 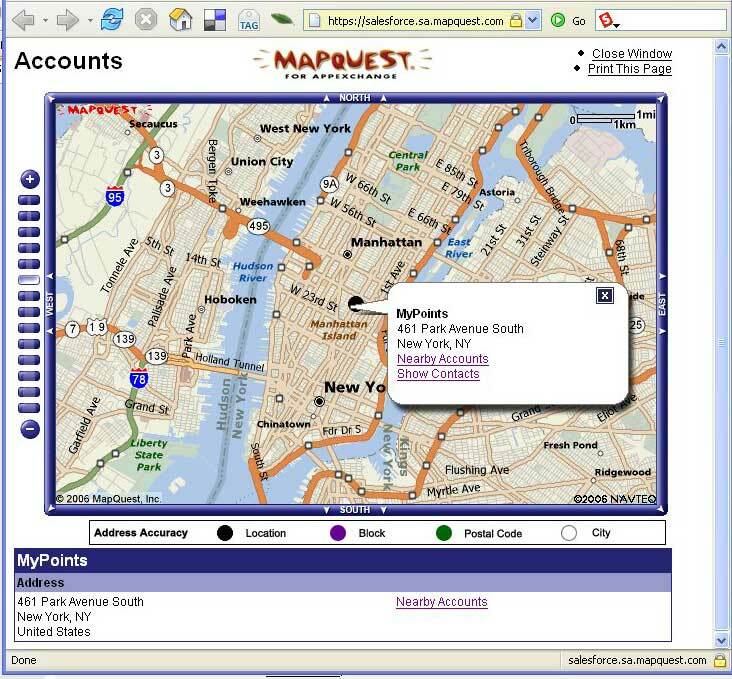 Go to any account or contact and you now have a Mapquest button that you can click to pull up a map of their area. Hover over the “dot” that represents your account and a callout flag pops up with the account information and links to show the details of that record, nearby accounts and contacts for that account. Click on the “nearby accounts” link and other “dots show up that you view by hovering over them. At this point you can see all of your accounts within the specified radius along with quick links to view their information. Let users set a default address and add a link to directions to or from the specified account. Collaborall launched an application on the exchange last week called Excellory that lets teams of people use and edit Excel spreadsheets within the SFDC environmnent. Different than Google Spreadsheets, Excellory actually uses Excel, a format most people are already comfortable with. Pricing starts at $1 per user / per month for 25+ users or $3 per user / per month for 5 users. It looks like the standard “non-salesforce” version is free on their website. Several collaborative spreadsheet products are already on the market, but this is the first to work within the SFDC framework. Look for someone to build a Google Spreadsheets for Salesforce once the API becomes available.